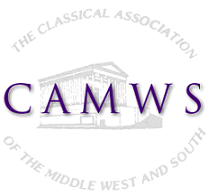 CAMWS was saddened to learn of the recent death of James Ruebel of Ball State University. Jim Ruebel was many things to our profession at large and particularly to CAMWS, as President (in 2001-2002), as scholar, indefatigable worker in & chair of committees, senior mentor to younger colleagues. As his long tenure as Dean of the Honors College at Ball State underscored, Jim was particularly committed to encouraging very bright undergraduates to reach higher in their studies. As we now consider how we might best honor his decades of service, I recommend we establish a fund to support undergraduates presenting papers at CAMWS. Assume 5% revenue: a fund of $18,000 would yield $900 p.a., which could support 3 grants of $300 (Undergrads have little chance of institutional support: $300 would be more helpful). I would suggest crystallizing this as the Ruebel Undergraduate Award fund, & more clearly, the Ruebel Seminar as a standing feature of the program. Not all presenters would have to receive the stipend: the honor of being in the named session would further highlight their achievement. $3000 has already between pledged to this effort. If you would like to honor Jim by making a contribution to this fund, you can do so here: https://camws.org/donate.